Easter’s not all about chocolate, of course, but fans of the sweet stuff could do worse than wend their way to Cologne for the Bank Holiday weekend. A visit to the World of Chocolate Museum leaves little doubt that this is a city that knows about fine confectionery, as well as being packed with pretty sightseeing, excellent restaurants and bars, and an array of museums and theatres to enjoy. A three-night stay costs from £540pp (two sharing) including return train travel (Eurostar to Brussels with onward rail connection to Cologne), B&B, a Cologne Welcome card and entrance to the Chocolate Museum. Easter’s not all about chocolate, of course, but fans of the sweet stuff could do worse than wend their way to Cologne for the Bank Holiday weekend. A visit to the World of Chocolate Museum leaves little doubt that this is a city that knows about fine confectionery, as well as being packed with pretty sightseeing, excellent restaurants and bars, and an array of museums and theatres to enjoy. Departing 18 April, a three-night stay is from £430 pp (two sharing) including return train travel (Eurostar to Brussels with onward rail connection to Cologne), B&B, a Cologne Welcome card and entrance to the Chocolate Museum. Fans of BBC2’s Great Continental Railway Journeys cannot help but have been inspired by the colourful history and dramatic beauty of Michael Portillo’s native Spain. 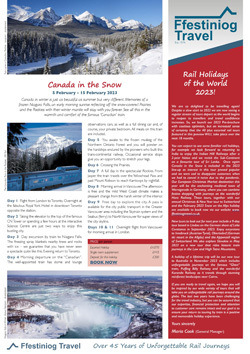 Rail travel experts, Ffestiniog Travel can replicate any of the itineraries featured in the series – adding extra destinations and personal preferences as required. Experience an Hispanic odyssey akin to Michael Portillo’s on a tailor-made, ten-day trip that costs from £1,055 pp. Price is based on two sharing and includes BA flights (London) or train to Madrid, onward rail travel Madrid to Gibraltar via Cordoba, Seville, Jerez, Ronda and Algeciras, excursions, and nine nights’ B&B in good-quality hotels. Fans of the sweet stuff need look no further for an Easter short break than Bruges. So renowned is the canal-side city for its chocolate that there’s even a museum dedicated entirely to it (with lots of free samples!) as well as plenty of atmospheric cafés and pretty shops selling all manner of chocolate treats. A four-night trip over Easter costs from £420 pp (two sharing) including return Eurostar to Brussels, onward rail travel to/from Bruges and four nights’ B&B in a centrally-situated hotel.